BELGRADE, SERBIA. 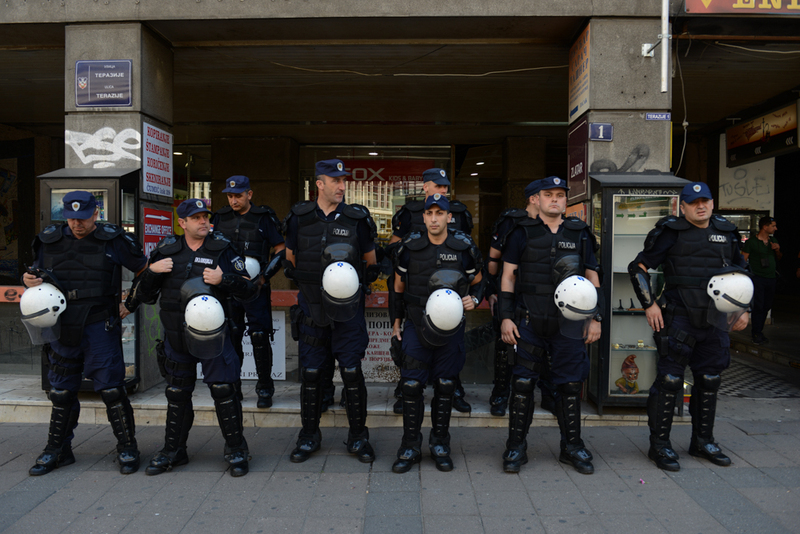 Serbian police in riot gear stand guard outside the Media Centar before a commemoration of the 20th anniversary of the Srebrenica massacre, widely labeled genocide in the eyes of International Criminal Court in The Hague and the international community, on July 11, 2015. Due to threats from nationalists, a planned die-in intended to represent the 8,000 who lost their lives in Srebrenica, Europe's largest postwar massacre, was cancelled and a much smaller commemoration of NGO officials was held at the Media Centar.